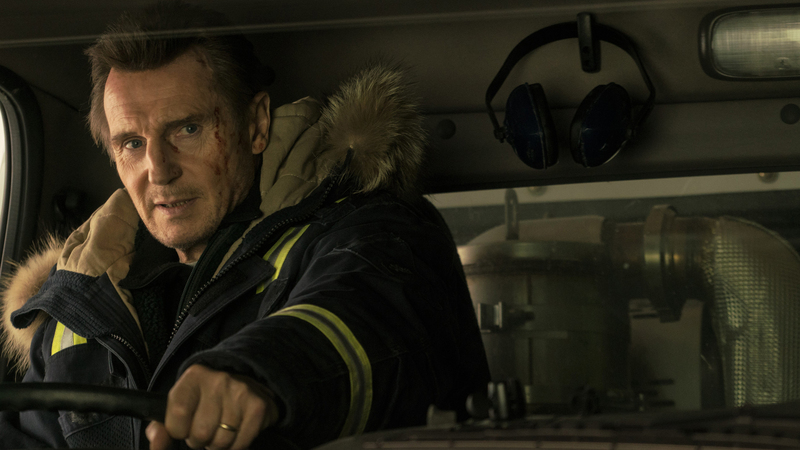 Seeing Irishman Liam Neeson take vengeance on a bunch of unsuspecting adversaries (employing his particular set of skills) seems to have become an annual start-of-the-year ritual, and judging by its IMDb logline — a snowplow driver seeks revenge against the drug dealers he thinks killed his son — his new thriller Cold Pursuit looks to be more of the same. This, however, isn’t the case. 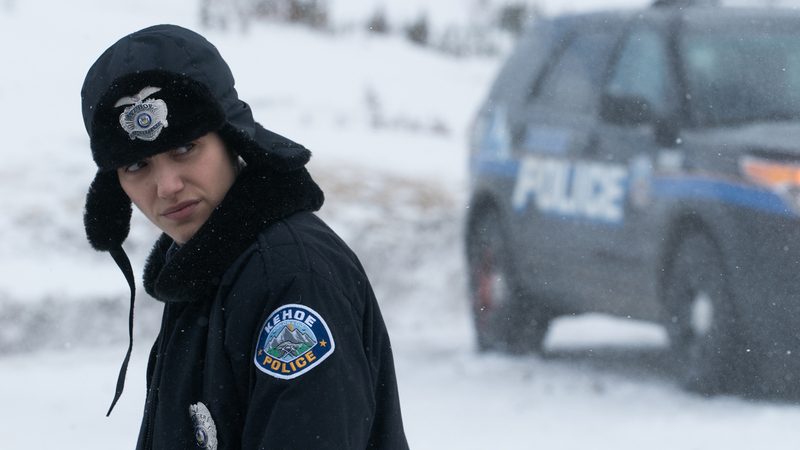 For starters, Cold Pursuit is not another slice of vigilante wish-fulfillment, as this new Nesson vehicle is a remake of a 2014 Norwegian black-comedy titled In Order of Disappearance aka Kraftidioten, which starred Stellan Skarsgård as the aforementioned driver turned killer. What’s particularly exciting here is that this English-language revamp has been directed by Hans Petter Moland, the same guy who helmed the original, with Moland joining the likes of George Sluizer, The Vanishing (1993), Takashi Shimizu, The Grudge (2004), and Michael Haneke, Funny Games (2007), who’ve all captained the Americanized version of their own foreign language films. Liam Neeson plays Nelson ‘Nels’ Coxman — and yep, there are plenty of quips about his surname — a quiet family man from Kehoe, Colorado, who generally keeps to himself, which makes sense, seeing as he spends most of his days alone, clearing the snow-filled roads around a lavish Rocky Mountains ski resort that nourishes the town — the movie opens when he’s receiving a ‘Citizen of the Year’ award for everything he’s done to help the community. When he’s not plowing snow, Nels is spending time with his wife Grace (Laura Dern) and grown-up son Kyle (Micheál Richardson, Neeson’s real-life kid) in his cozy log cabin home up on the mountains. Everything changes after Kyle, who works as a baggage hauler at Kehoe airport, is found dead of a heroin overdose. Although the local authorities are convinced that this is an open-and-shut case, Nels is adamant that his son wasn’t a ‘druggie’ and looks for another answer. His grief-stricken wife, however, eventually accepts the cause of death along with the fact that they mightn’t have known their son as well as they thought, and up and leaves him (and the whole movie entirely). On the verge of suicide, Nels has an encounter with his son’s bruised and battered co-worker Dante (Wesley MacInnes), who turns up at Nels’ workshop, informing the distraught dad that Kyle was the unfortunate victim of a drug smuggling deal gone sour. It turns out that a criminal syndicate from Denver had been using the airport to traffic cocaine, and that Kyle was murdered for a mistake that Dante had made. Naturally Neeson … I mean Nels retaliates by taking it upon himself to ice the goons that were involved, working his way up the chain of command, unaware that his son was collateral damage in a longstanding turf war between two rival cartels — one headed by dickish kingpin Trevor ‘Viking’ Calcote (Tom Bateman, who’s relishing the role), and the other a Native American gang run by an antiquities dealer known as White Bull (Tom Jackson). A far cry from your typical Neeson actioner, the script by newcomer Frank Baldwin — who’s working from the Norwegian screenplay by Danish writer Kim Fupz Aakeson — is fairly grounded in reality, and much more character focused than the usual vengeance fare — think the razor-sharp writing of Fargo (1996) as opposed to the non-stop action of Taken (2008), an obvious comparison, I know. Characters are fleshed out and given backstories, including Bateman’s egotistical crime boss Viking, who is squabbling with his ex-wife Aya (Julia Jones) over custody of their bright young son Ryan (Nicholas Holmes), whom Viking gives terrible advice to (on how to deal with bullies) and maintains a regimented diet for. Then there are Viking’s (likeable) nicknamed henchmen — i.e., Mustang (Domenick Lombardozzi) or Dexter (Benjamin Hollingsworth) or Bone (Gus Halper) — who drive his son to school every morning — two of whom are secretly in love with one other. We also get to know the opposing Native American cartel — a new addition to this Westernized re-telling — and how they’re constantly being reminded that the whites have kicked them off/ taken over their own land. Additionally, we cut to the small-town cops trying to make sense of the string of dead bodies that continues to pile, lead by Emmy Rossum’s eager detective Kim Dash and her less enthusiastic veteran partner John ‘Gip’ Gipsky (John Doman), this duo providing a lot of light comic relief. Lastly, William Forsythe, Raising Arizona (1987), is ace as Wingman, Nels’ retired mobster brother, despite his limited screen time. Be that as it may, the film still features a massive body count, Neeson’s Coxman punching and shooting his way through a line-up of thugs. This guy doesn’t even care about stealth — at one point, Neeson (who can play this sort of role in his sleep) struts through a crowded nightclub in his oversized parka — dispensing baddies one by one with a sawed-off rifle, wrapping them up in chicken wire then tossing them down the same waterfall so the fish can peck at their flesh. And he’s learnt all of this from reading crime novels. Heck, Neeson even uses heavy machinery to take-out bad guys! Each death is followed by a headstone-type title card that pushes the film into parody territory, audiences made aware of character specs once they’ve been knocked off. Unlike 2011’s The Grey, this isn’t your dad’s Liam Neeson movie, which may ultimately hurt box office numbers. Be that as it may, Cold Pursuit is still sharper, funnier and more stylish than any of his other potboilers; production design here by Jørgen Stangebye Larsen, In Order of Disappearance (2014), is excellent (notice now Viking’s cold modish lair and Nels’ warm cabin reflect their personalities), as are the frosty vistas shot in Fortress Mountain in Alberta, Canada, and captured by returning DOP Philip Øgaard. 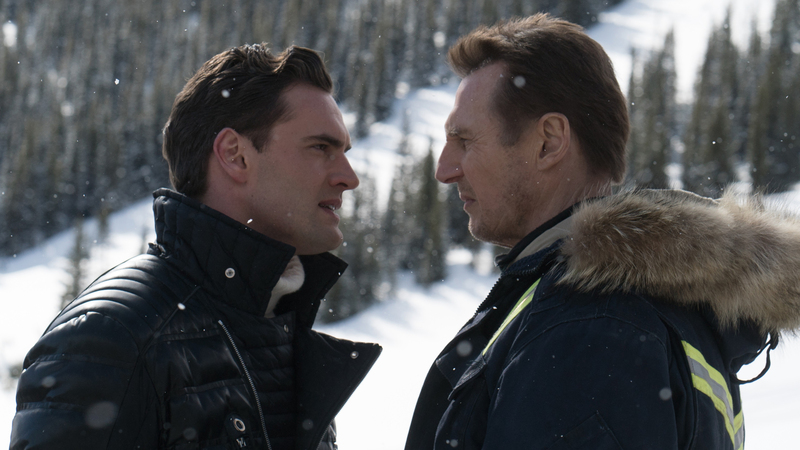 Although some might be disappointed that Cold Pursuit is more of a black-comedy rather than a straight shoot ‘em up, this one’s still worth taking out for an ice-cold spin!